THE young girls looked up at the striking male Cuban dancer - tall, dark and fit, with long dreadlocks in a Mohawk style - drinking in every word of his heavily accented English. They squealed with delight as he demonstrated sultry dance moves, executing everything he threw at them with precision and ease. This was just one of the magical moments during a workshop on Thursday to share the performance techniques of the Cuban Habana Compas Dance group. Earlier, this dancer Renyer Bacallao and another male dancer, performed an exciting piece, each wielding two cutlasses. In TT, this type of dance is performed for the Orisa God, Ogun. 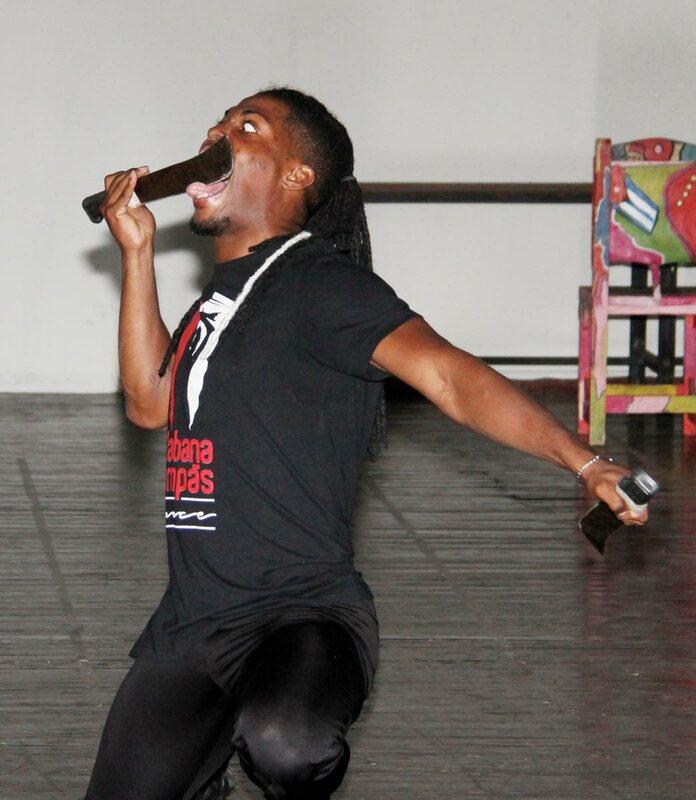 Naturally, Bacallao licked the blade during the performance, in the style of African dancers from the continent. Their dance was certainly a testament to the survival of African cultural forms, even in the face of the globally oppressive system of slavery. I think this is what stood out the most – the fact that artists from two different countries, speaking different languages could communicate so seamlessly with each other. Of course, it goes back to our shared histories. European mercenaries began trading in African enslaved persons in the 1400s; by the 1500s captured Africans were taken to Cuba. One source notes that the people taken there originated primarily from Bantu, Yoruba, Ibo and Ewe or Fon ethnic groups. These are some of the same peoples who would have been transported to parts of the Caribbean and America. As with TT, Cuba was home to indigenous populations before the arrival of Columbus, who then claimed the island on behalf of Spain. It is believed the word Cuba comes from the Taino language, but understandably, this has been difficult to prove. Cuba was a colony of Spain from 1492 - 1868, when Cubans rebelled against what they felt was despotic Spanish rule. Between 1868 and 1894 some 700,000 Spanish immigrants went to Cuba, influencing what is referred to as “a process of intensive Hispanisation...” This helps to explain why the dance performance of Habana Compas focused so heavily on Flamenco, which is mainly known as a dance of Spanish origin. Actually, this is where the notion of ‘linkages’ becomes even more fascinating. According to Britannica online, the origins of Flamenco may be found in the migration of the Roma people of southern Spain “from Rajasthan (in northwest India) to Spain between the 9th and 14th centuries. The Moors are a conquering people from Northern Africa who impacted Europe as they settled and intermingled with Europeans. (Remember Shakespeare’s Othello – The Moor of Venice?) Now it is easier to understand the stamping style of the flamenco which draws not only from Indian foot movements, but from African influenced tap dance as well. Their instruments were also familiar. In addition to what we call a tok tok, the short wooden sticks that you hit together to make a sound, an important aspect of their sound is what we call a shekere. This is an instrument that originated in Africa. It is made from a large hollowed out calabash, covered with a string of beads, shells or any material that will make a sound when it is shaken. And not surprisingly, integral to their music is perhaps the ultimate instrument of resistance and diaspora connectivity - the drum. Thank you to the National Dance Association and all involved for the gift of the Habana Compas Dance group. Dancing with the Cubans was worth every step. Dara E. Healy is a performance artist, communications specialist and founder of the NGO, the Indigenous Creative Arts Network – ICAN. Reply to "Shades of Africa in Cuban dancing"